The best page for Longhorn Steakhouse menu prices! Longhorn Steakhouse is a popular restaurant known for its Texan/Western theme, and while their menu varies it is best known for grilled steaks and its signature Outlaw Ribeye®. Besides steak, this casual diner serves up a host of salads, shrimp, lobster, chicken, and ribs plus offers appetizers, margaritas, and specialty drinks. Kids are not forgotten and they have their own menu to choose from. Longhorn also has featured specials that change regularly and they continually add new menu items. Be sure to visit often to taste them all. Share your love for Longhorn by giving personalized gift cards as gifts. Who can’t resist a great tasting, grilled streak! Below are the latest Longhorn Steakhouse menu prices. Sometimes our days are filled with appointments and activities that making a special visit to Longhorn Steakhouse is not possible. That does not mean you cannot enjoy your favorite dishes. Most Longhorn Steakhouse locations offer online ordering with pickup. Simply select your favorite location on the website, choose want you want to eat, and select the pick-up time. What could be simpler? Longhorn Steakhouse does not accept reservations but does offer Call Ahead Seating. Most locations are open 7 days a week at 11:00 for Lunch and start serving dinner at 4:00 pm. Join the best tasting club around! Membership is free and includes exclusive offers, a reward for free appetizer just for joining, and the latest news. Did we mention it is free to join? At Longhorn Steakhouse, it is not just about food and great steaks but also about giving back to the communities we live and work in. Longhorn Steakhouse and its employees participate and give back through several programs. Food donations are provided to local food banks and non-profit organizations. During the Holiday season, Longhorn employees donate toys, clothes and other household items to families in need. Each Longhorn restaurant is committed to making their location sustainable. Each location works at reducing cardboard and plastic waste and reducing water usage. Longhorn is also involved in helping to find ways to reduce the environmental impact of beef production. This is your chance to be the grillmaster of the backyard cook-out! Head over to the Longhorn Steakhouse website and you can view videos from expert grillmasters on how to cook a steak to perfection. Looking for new recipe ideas for your next BBQ party? Longhorn Steakhouse offers new and exciting recipe ideas that you can try at home. Longhorn Steakhouse wants to help you make the best food choices. To achieve that, Longhorn Steakhouse makes every effort to provide you a complete and accurate nutritional guide for all its menu items. Food allergies should not stop you from enjoying a great meal at Longhorn Steakhouse. Take a look at the allergen guide to see which common allergens are included in Longhorn Steakhouse food items. Both guides can be found on the Longhorn Steakhouse official website. Longhorn Steakhouse offers you the opportunity to start your career or advance your career. The choice is yours. Visit the Career page on the Longhorn Steakhouse official website to learn about current opportunities, training program, and compensation package. Recent college graduates and veteran service members are encouraged to apply. 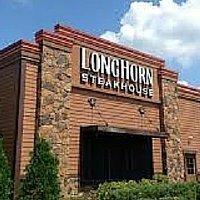 Longhorn Steakhouse was founded in Atlanta, Georgia in 1981 and is the brainchild of George McKerrow, Jr.and his father. From the early days, The Longhorn was known for serving quality grilled steaks. The combination of a freak snowstorm in January 1982 and $1 drinks set the path for future growth for The Longhorn Steakhouse. Today, the Longhorn Steakhouse is a wholly-owned subsidiary of Darden Restaurants Inc. and is headquartered in Orlando, FL. There are now over 470 Longhorn Steakhouse locations in 40 states. You can connect and follow Longhorn Steakhouse through several social media platforms. For more information about Longhorn Steakhouse locations, news and the latest dish creations, visit their official website. Food and service are always above the standard, never short on either. Florence, Al. Restaurant did not have any side item with their ribeye. They just brought out the steak. Nothing else. We had told them we did not want a roll. So all we got was the steaks. We asked about a side and the waitress said it did not come with a side but we could order onr. So we ordered off the menu and paid for a side, after we had received our steaks. I went to the Berwyn Location. There was a 45 minutes waiting time so we went to the bar since we didn’t have much time, we ordered Medium rare steak and mine was medium well. We realy don’t like surprises. Didnt see a seniors menu ???? Didn’t see a Veteran Discounts ??? I have allergies, tons of them. First time in years a restaurant meal came out right the first time. Excellent rare prime rib and extra rare NY strip without seasoning. Service exceeded the normal, didn’t balk at my required numerous exclusions. My spouse didn’t have to hear a single complaint for the first time in years. Shared a molten lava cake to celebrate the great food. Both spouse and myself are very good cooks, but it is so difficult to go out and find simplified foods and have professional service on top of it.